On January 5, 2017, Mr. Blackburn was working on a construction site located in Bay Shore, New York. The site appeared to be an old food production facility. It was about 11:30 a.m. when Mr. Blackburn was doing demolition on the 3rd floor. His task was to dissemble a wall. He was on an 8-foot Baker scaffold knocking the cement blocks out of the wall. He had just loosened a block with his hammer and was now going to push the block to the floor with his arm. He reached forward and gripped the cement block with his right arm when suddenly the platform of the scaffold collapsed! As his right hand was holding the cement block, his right shoulder was yanked as he fell to the floor. His supervisor came over but offered little aide. He tried to continue working but could not. Later that day, Mr. Blackburn’s wife took him to the emergency department at Northwell Health (formerly North-Shore LIJ). Due to the incident, Mr. Blackburn suffered injuries to his right shoulder, neck, and lower back (right shoulder sprain and lumbar spine strain). Thankfully, Mr. Blackburn had no lacerations or loss of consciousness as a result of the accident. He came under the care of physical therapy, chiropractic care, and acupuncture. He attended therapy for a year and received an injection to his shoulder to help with the pain. Mr. Blackburn was unable to work for 8 months, which meant that he lost over half a year in wages due to his workplace accident. Mr. Blackburn was unable to work in the construction industry ever again. Thanks to a friend’s recommendation (who happens to be a loyal listener to Adam’s show on the radio), Mr. Blackburn contacted The Case Handler team at Pollack, Pollack, Isaac & DeCicco! The defendant’s insurance company initially offered $60,000 to settle Mr. Blackburn’s bodily injury claim. 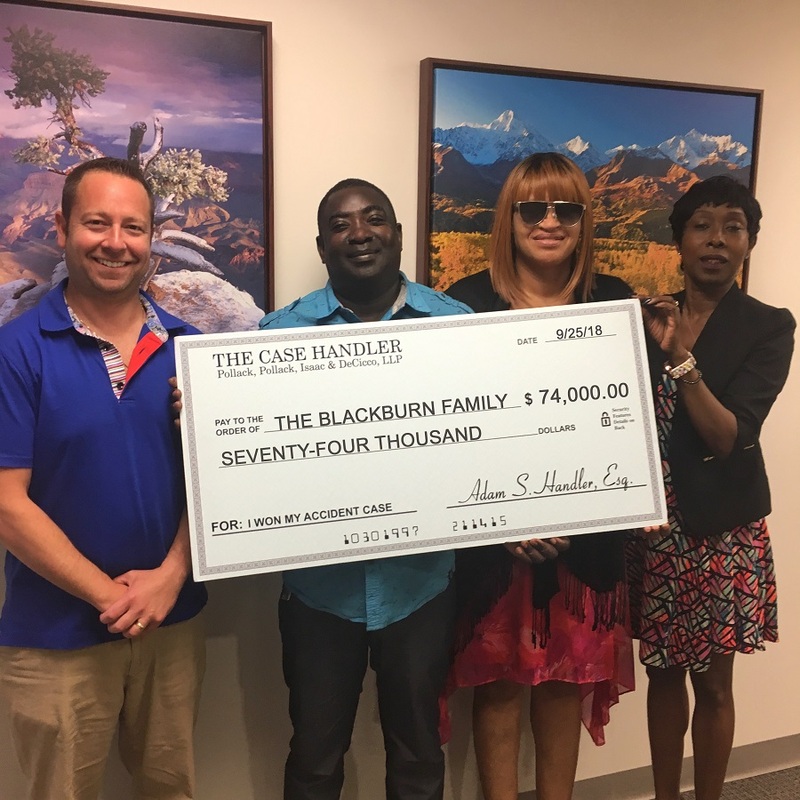 With the help of our dedicated Bay Shore construction accident lawyer, The Case Handler team successfully negotiated an additional $14,000 to their original offer for a total settlement recovery of $74,000.00!